I have a list of dicts, and I'd like to remove the dicts with identical key and value pairs. The strategy is to convert the list of dictionaries to a list of tuples where the tuples contain the items of the dictionary. Since the tuples can be hashed, you can remove duplicates using set (using a set comprehension here, older python alternative would be set(tuple(d.items()) for d in l)) and, after that, re-create the dictionaries from tuples with dict. Note: As pointed out by @alexis it might happen that two dictionaries with the same keys and values, don't result in the same tuple. That could happen if they go through a different adding/removing keys history. If that's the case for your problem, then consider sorting d.items() as he suggests. Here since we can use dict comparison, we only keep the elements that are not in the rest of the initial list (this notion is only accessible through the index n, hence the use of enumerate). It preserves the order of the original list and ut can also handle unhashable items like dictionaries by falling back on a slower algorithm (O(n*m) where n are the elements in the original list and m the unique elements in the original list instead of O(n)). In case both keys and values are hashable you can use the key argument of that function to create hashable items for the "uniqueness-test" (so that it works in O(n)). I thought it might be useful to see how the performance of these approaches compares, so I did a small benchmark. The benchmark graphs are time vs. list-size based on a list containing no duplicates (that was chosen arbitrarily, the runtime doesn't change significantly if I add some or lots of duplicates). It's a log-log plot so the complete range is covered. The second approach from thefourtheye is fastest here. The unique_everseen approach with the key function is on the second place, however it's the fastest approach that preserves order. 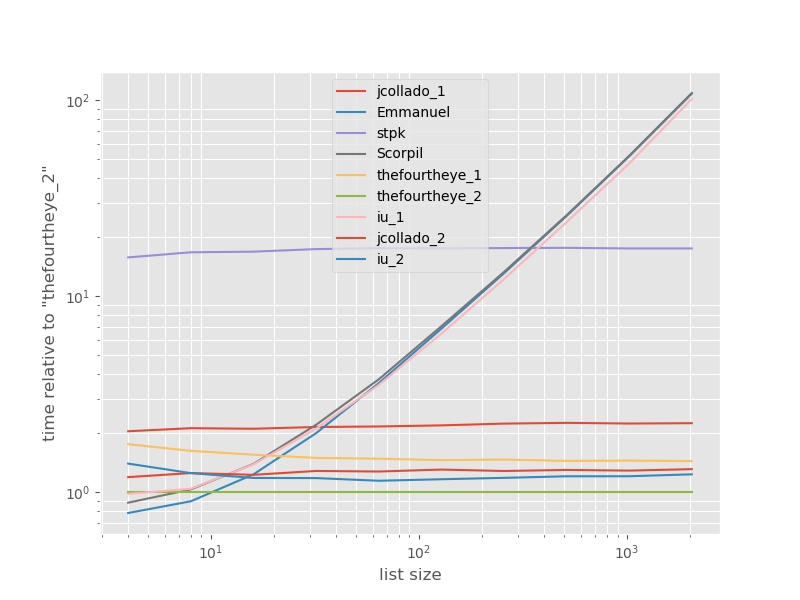 The other approaches from jcollado and thefourtheye are almost as fast. The approach using unique_everseen without key and the solutions from Emmanuel and Scorpil are very slow for longer lists and behave much worse O(n*n) instead of O(n). 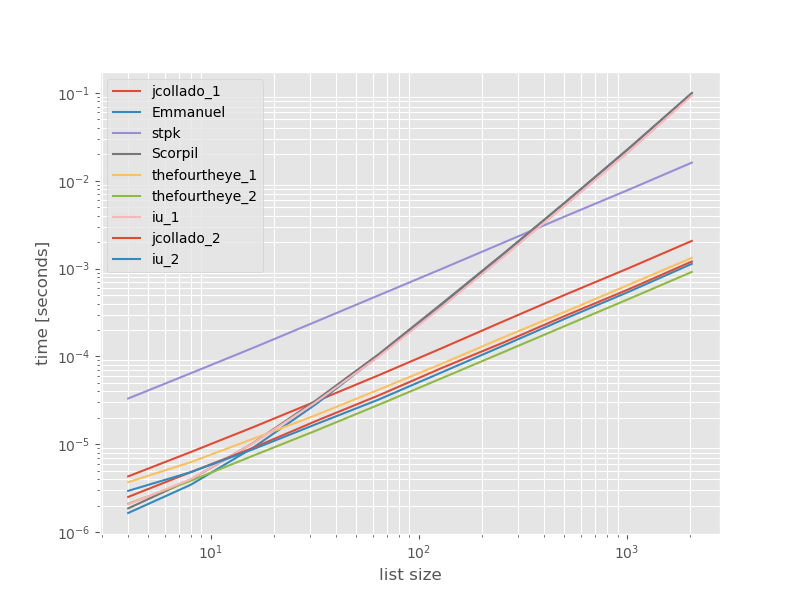 stpks approach with json isn't O(n*n) but it's much slower than the similar O(n) approaches. The timings don't change significantly except for unique_everseen without key function, which in this case is the fastest solution. However that's just the best case (so not representative) for that function with unhashable values because it's runtime depends on the amount of unique values in the list: O(n*m) which in this case is just 1 and thus it runs in O(n). Disclaimer: I'm the author of iteration_utilities. If you are using Pandas in your workflow, one option is to feed a list of dictionaries directly to the pd.DataFrame constructor. Then use drop_duplicates and to_dict methods for the required result. Works with nested dictionaries and (obviously) preserves order. You can use a set, but you need to turn the dicts into a hashable type. 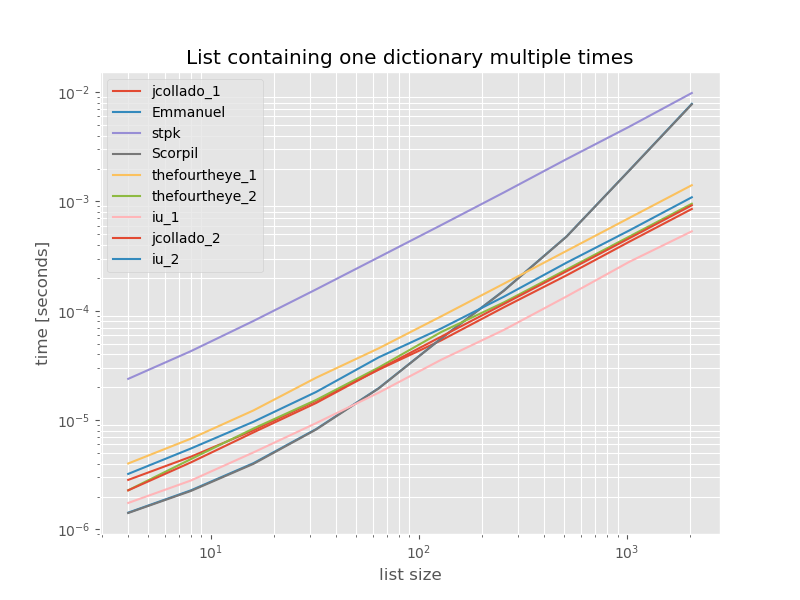 How to check if the dictionaries in a list are unique?